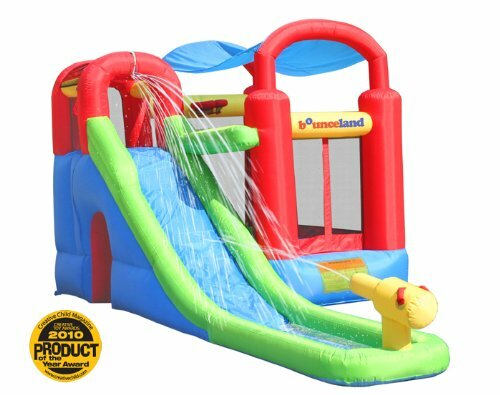 Water slide bounce houses are multi-purpose additions to help keep the kids happy, exercised and entertained all summer, right in the privacy of your own backyard. No more expensive trips to water or amusement parks. 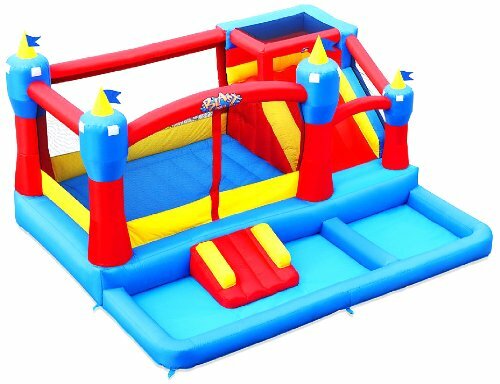 There are thousands of high quality, different themed bounce houses available these days, why not combine it with built in water fun to get the most bang for your buck. The kids will love it and you will be the most popular parents on the block. A win, win situation. This wet and dry bouncer is definitely a multi-purpose backyard toy. 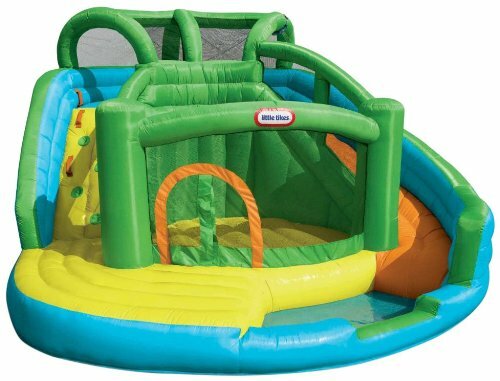 It has a large bouncing surface with a safety net entrance way and a climbing wall that leads to a crawl tunnel and a large slide. 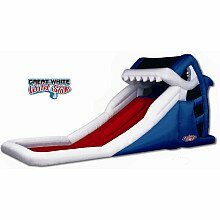 The slide ends up in a cool splash pool for safe and wet landings. It can be used wet or dry and is recommended for kids 5-10 years. The product can hold up to a maximum of 4 kids or a combined weight of 350 pounds. This combo playstation is easy to set up and take down and it inflates in less than a minute. It is made to be durable with heavy duty puncture proof materials and double to quadruple stitches. The age recommendation is 3-10 years. Truly a multi-purpose playhouse that includes, a ball pit (30 balls included), tunnel, basketball hoop, water gun, long slide, splash pool and Velcro roof top for shade on those hot summer days. Holds up to four kids at once with a maximum weight of 400 pounds. Recommended for kids 3 -12 this is a cool bounce house with a slide, water park and ball pit all in one. The maximum occupancy is 5 kids with a weight of under 100 pounds each. This bouncer can be used wet or dry. Ball pit (balls not included) can be filled with water on those hot sunny days for extra wet fun. Fun and colorful castle theme for imaginative play. 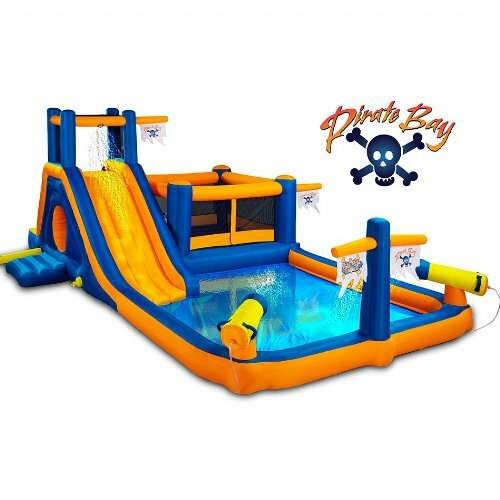 The ultimate backyard fun with this pirate themed bouncer and water park. Inflates in minutes for hours of play and imagination. 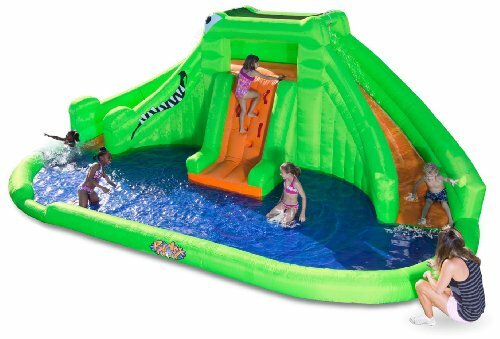 Crawl tunnel, bouncer and splash pool complete with two water cannons make this one a must for backyard fun and exercise. The Pirate Bay Inflatable water park comes with fan, storage bag, sprayer assembly, stakes and blower. Backyard imagination, exercise and fun all rolled into one. This is a pretty good sized water park with dimensions of approximately 14 foot length, 22 foot width and 8 foot in height. This is a popular one that has a crocodile theme. It features two slides, a massive splash area and a climbing ramp. Add some optional play balls to enhance the splash area. It is a blast zone product which means quality and durability. Includes blower, carrying case and instructional manual and DVD. Park inflates in minutes for all day exercise and water fun. Straight up fun with this giant water slide by Blast Zone. It’s dimensions are 21x6x9, it inflates in minutes, it’s colorful, and your kids will never stop running and sliding all summer. But wait, it can also be used without the water for year round enjoyment. Two kids at a time on this slide. The back and top are enclosed with safety netting and the back area has an inflatable platform making it easy for your kids to climb up safely. Year round sliding fun on this baby.